I was trying to keep this blog up-to-date, but life gets in the way and it isn't easy to do everything I want to do. It doesn't stop me from trying though! Yes, you can laugh if you do the same. I am now at Day 26 and most of the plants are doing well. I did transplant them into bigger planting pots the other day as you can see in this picture. The tomato seedlings had mostly reached two sets of leaves and I just felt like they needed to stretch their roots. This is all a new experience for me, so maybe I did the right thing and maybe not. 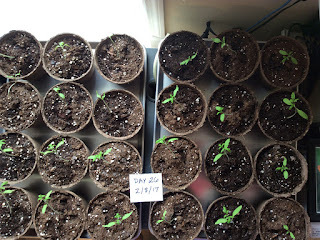 The tomato seedlings look happy and healthy, so I think I'm on the right track. Since there was a packet of fertilizer that came with the Burpee Seed Growing Kit and so I sprinkled that in the edges of the planter pots, spreading and distributing it evenly. Then I watered it in. The instructions on the package weren't that great. If I didn't think we would have the threat of anymore cold weather or frost, I'd put these outside now. Unfortunately, this is still February and it can get quite chilly here for plants. So, I will wait until the first of March before I plant them outside in the earthbox. If you want to watch my tomatoes grow, check out the following video on YouTube. It will give you a sense of what happened every day as I've been trying to record that each morning. Plus, you get to listen to my very relaxing piano music playing in the background. It is a short video, so go ahead - take a look. I will be writing soon about what costs I have put into this endeavor so far. I want to record that so I'll have it the next time I do this. Some of what I have purchased to do this, I won't have to purchase again. But hey, I'm getting ahead of myself because that's for another blog post!